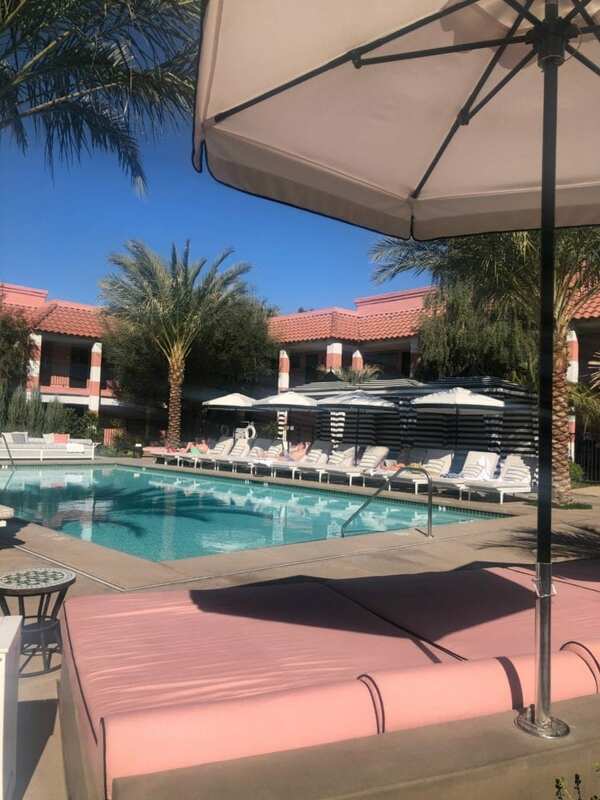 This past weekend I went to Palm Springs, California with the clothing brand Chico’s. 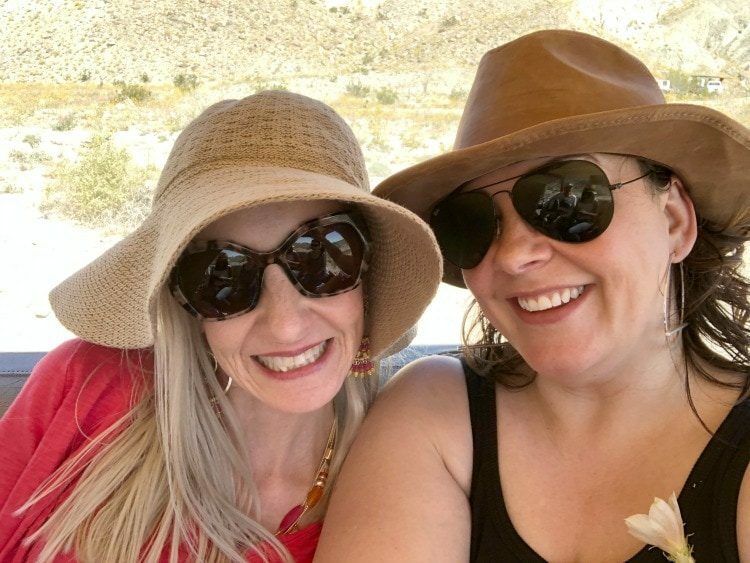 Along with four other over-40 influencers (Sheree of SheSheShow, Dawn Lucy of Fashion Should be Fun, Tonya of The Real Chic Life, and Jamie of More than Turquoise), we had a weekend of fashion and adventure. I was not paid or required to post about this trip. However, the entire trip and activities were covered by Chico’s. There are also affiliate links in this post; if you click on a link and make a purchase I may receive a small commission. 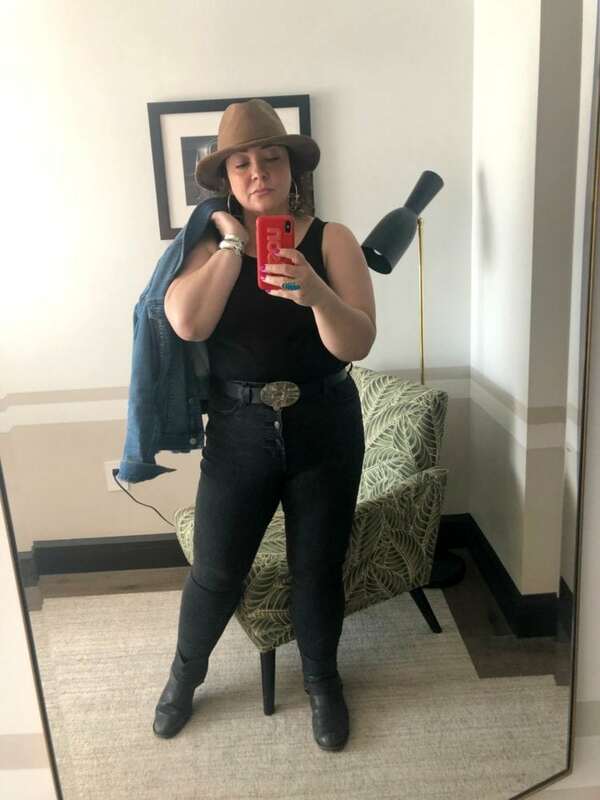 If you’ve read this blog for a bit, you know I am a fan of Chico’s. I appreciate their size range, their quality, and how they craft clothing that is comfortable, stylish, and creates solutions for many fashion situations (no stain, no need for iron, UPF, etc.). 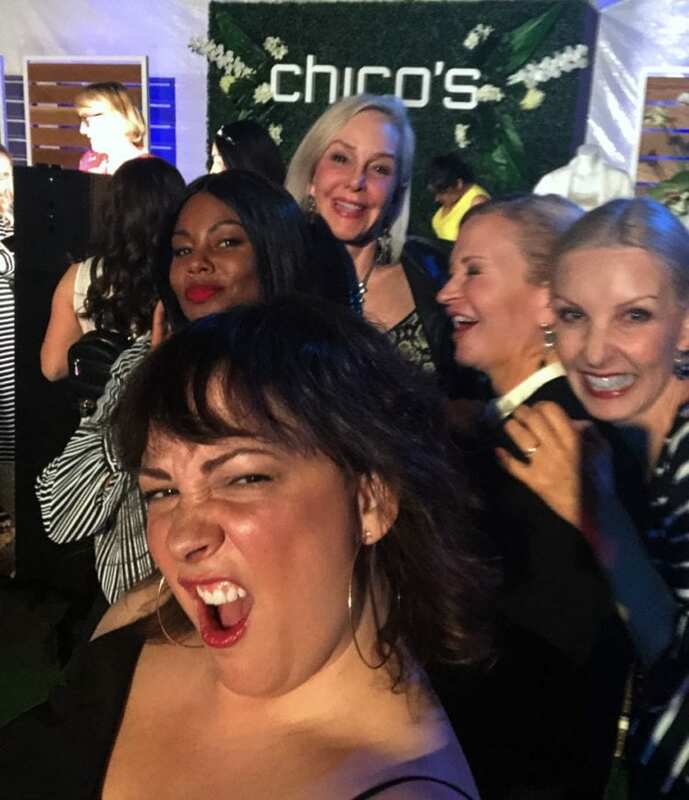 As an influencer, I love Chico’s even more because I get a big of the behind the scenes: I have visited their headquarters and seen how they create collections and work with fit models, I know how they do so much to help women, and how amazing they are to work with on a business level. So when they asked me if I would like to visit Palm Springs with them and attend Fashion Week El Paseo I didn’t hesitate in emailing a reply of YES YES YES! 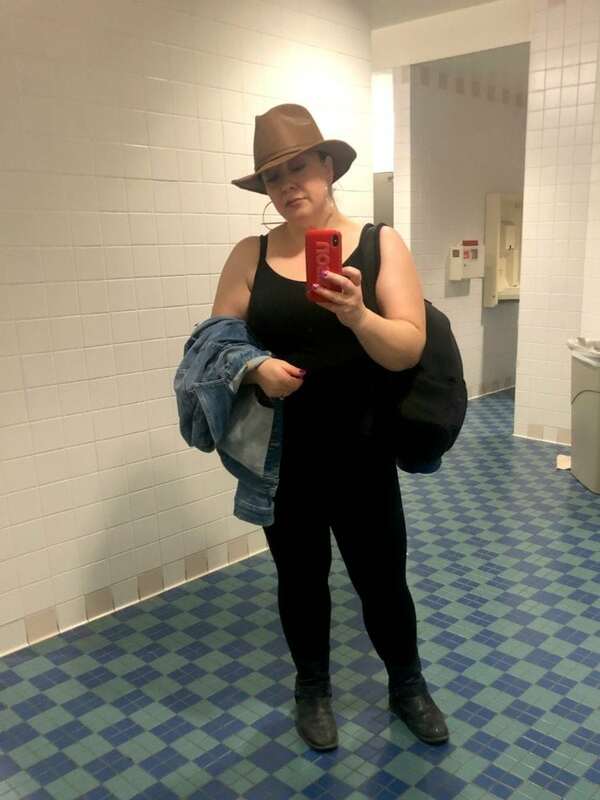 For the flights, I dressed for comfort as I’d be transferring flights and traveling all day. 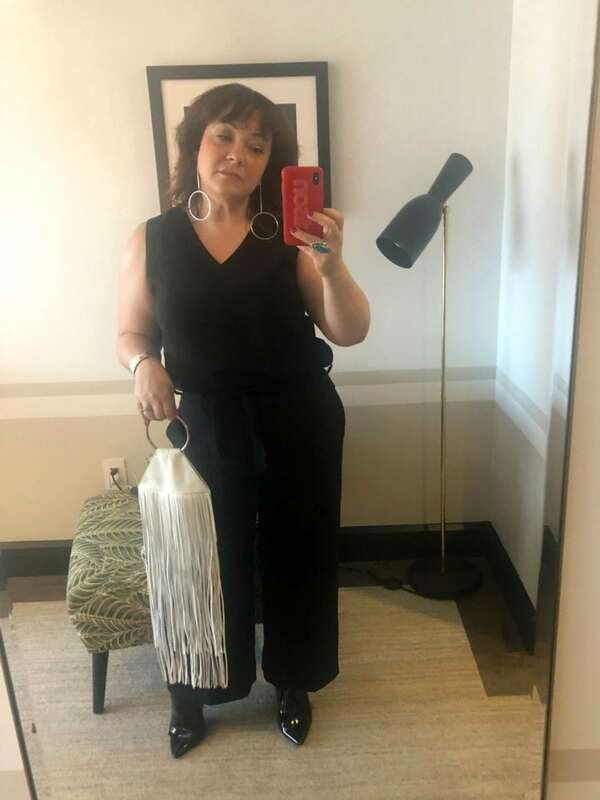 A simple black cami and leggings which were comfy but looked relatively sleek. 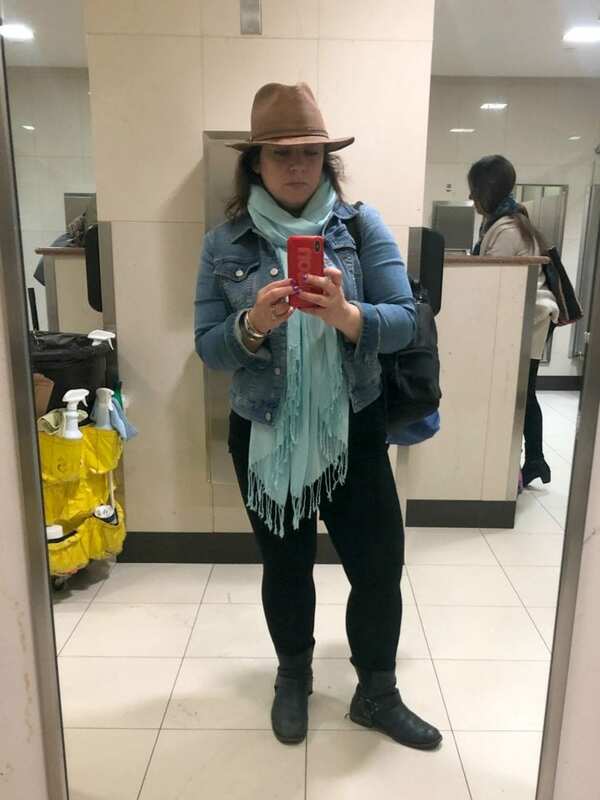 I wore my heaviest shoes to keep my luggage light, a lightweight pashima in case it was chilly on the flight, a hat to hide hat head and also keep the hat from being crushed in my suitcase, and a denim jacket because of all of the pockets. Major shoutout to this denim jacket. My old favorite denim jacket no longer fits. I saw this one at Soma (yes they have clothes as well as underpinnings!) and asked if I could try it. I am officially obsessed. It’s super stretchy but you’d never know because looking at it and touching it, it looks like regular denim. It has the regular pockets but they’re sewn so you have two deep interior pockets. I could carry my phone, my small wallet, a phone charger and cord, lip balm, my tickets, and more in those pockets without issue. I wore that jacket multiple times during the trip and it wasn’t planned for my return outfit but I wore it again because it was so great for the flight there. 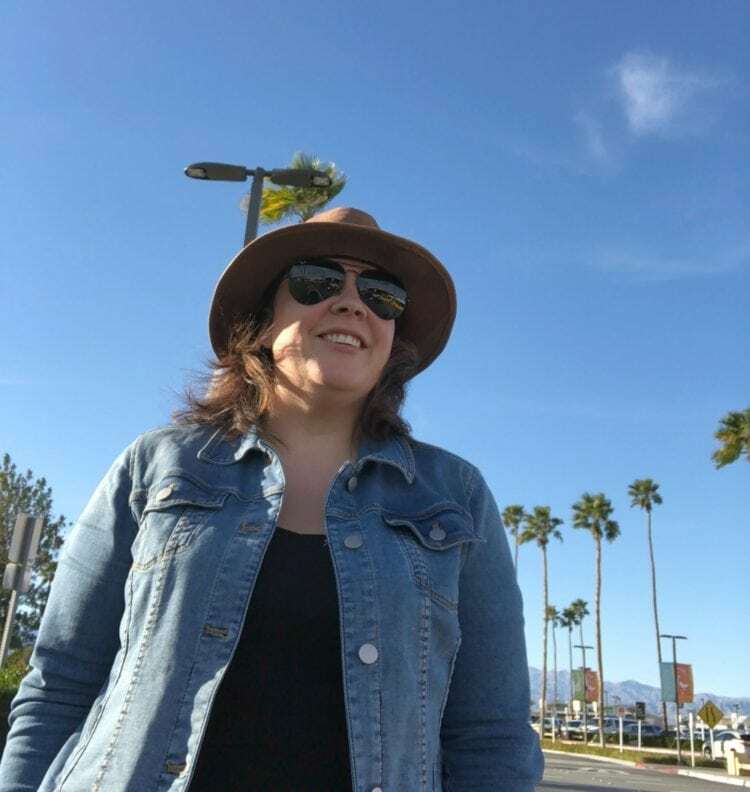 I arrived in Palm Springs around 5pm on Friday. It was in the low 70s, there was a slight breeze, and not a cloud in the sky. A car met me at the airport and took me to Sands Hotel and Spa. 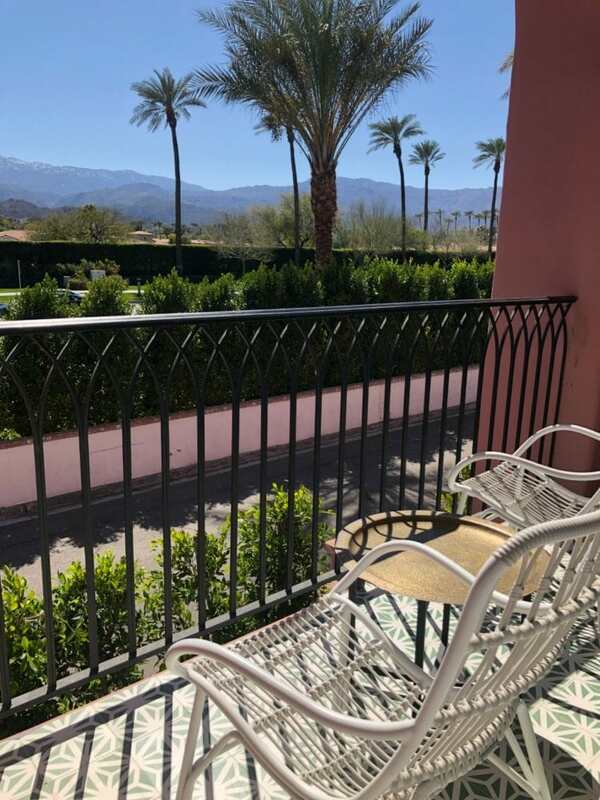 Originally built in the ’50, Sands closed for a bit and reopened just last year becoming one of the chicest places to stay in Palm Springs. 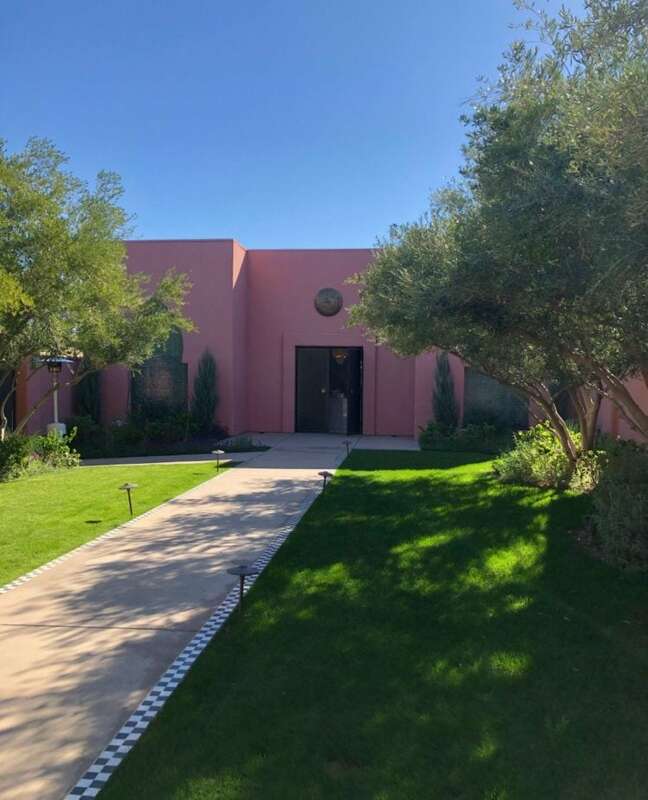 A beautiful rose pink with black and white tile trim and a gorgeous pool in the center of the compound, Sands is totally charming and totally gram-able. 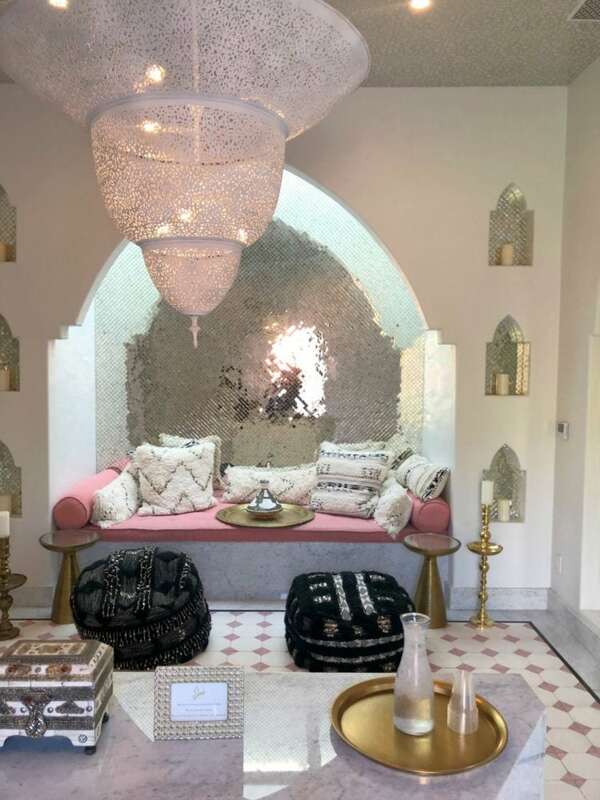 I received a glass of Moroccan tea upon check-in, and their pale pink polo-clad staff assisted me in bringing my bags to my room. The room was just as gorgeous. 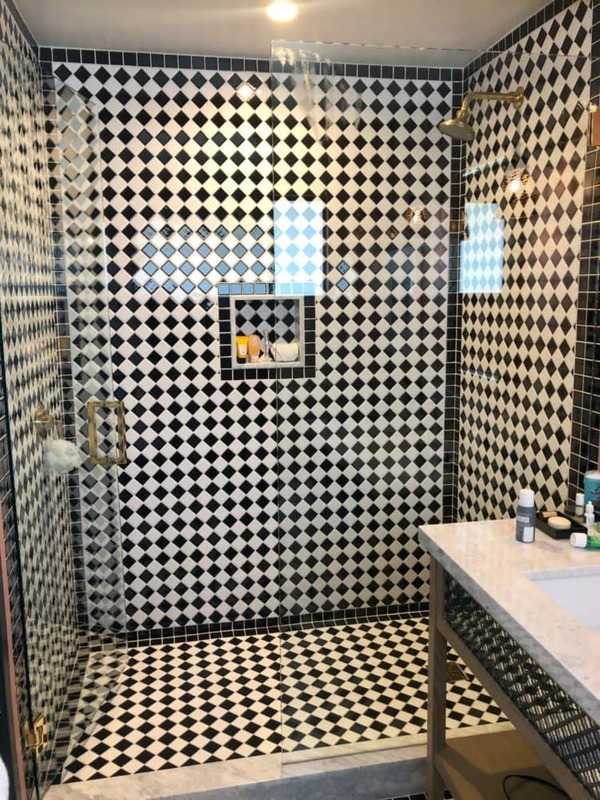 The bathroom had a huge shower tiled in black and white, the bedroom had a Palm Springs meets Morocco vibe, and there was a large balcony with a spectacular view. 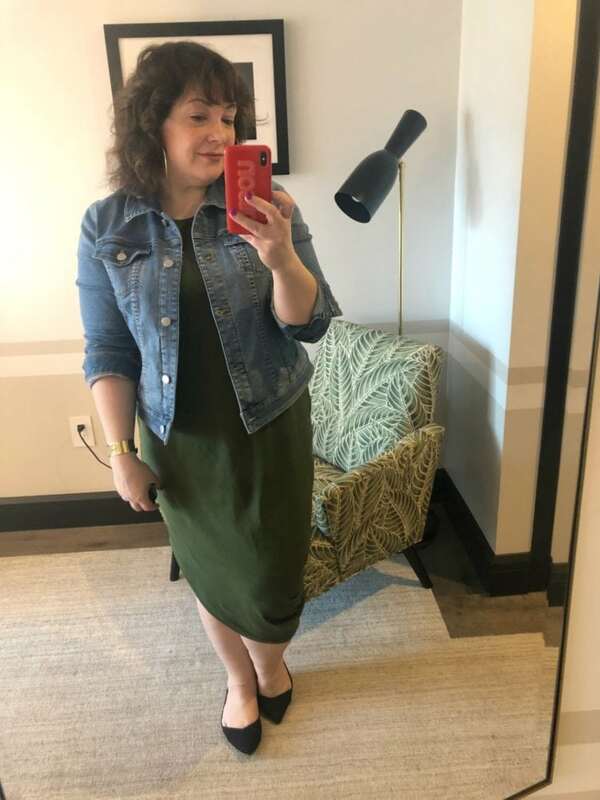 I didn’t have time to shower after my flight, so I cleaned up as best I could and put on the easiest thing I brought – a jersey jumpsuit and a pair of flats. Simple, comfy, and chic and totally appropriate for the venue. 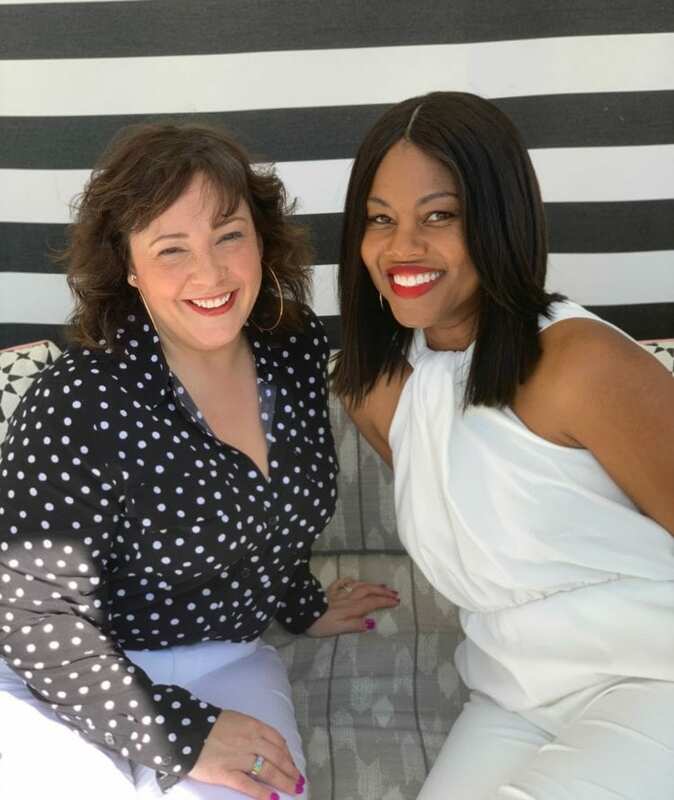 Tonya and I were the two influencers coming from the East Coast so we were flown in the first day so we could rest up; the two of us and three from Chico’s had dinner together at the hotel restaurant, The Pink Cabana, and caught up. 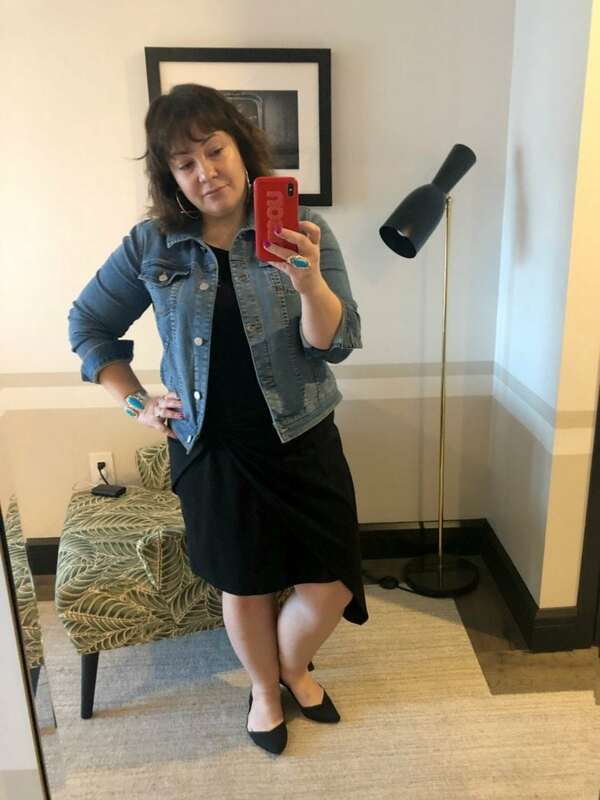 I actually ended up going to bed in the shorts and a black cami, but since I wrote so much about this bra decided to get all sassy and show it off. These two pieces from Soma are from their Cool Nights collection. Super lightweight, feel cool and silky, and are favorites at home and on travel. And this print is just too fabulous. I met Tonya for breakfast at the hotel restaurant, an adorable place with a delicious menu. I had the avocado toast and about a gallon of coffee. Tonya and I met in Florida last year. Once back, we had lunch together before she moved farther away; she's such a joy to be around and I was glad to see her. After, we had free time in our schedule. Tonya and I took some pictures of our outfits, scoped out the scene at the hotel pool, and met up with the other influencers as they arrived. 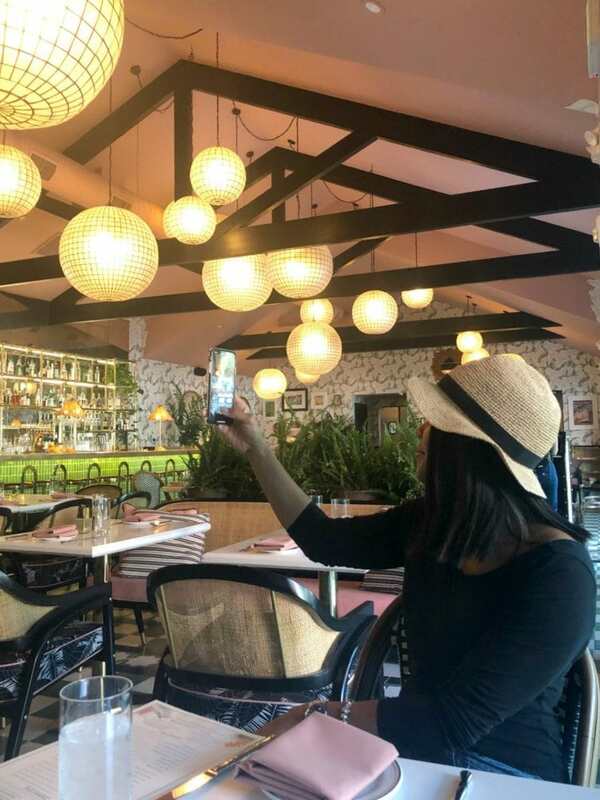 With all the influencers in Palm Springs and checked into the hotel, Chico’s took us to lunch at AC3 Restaurant and Bar which just won the award for Palm Desert Best New Restaurant. We got a table outside on their covered patio and caught up over delicious salads and iced tea. I hadn’t seen Sheree or Jamie since the Florida trip last year and though I feel like I’ve known here for years hadn’t yet met Dawn Lucy in person. 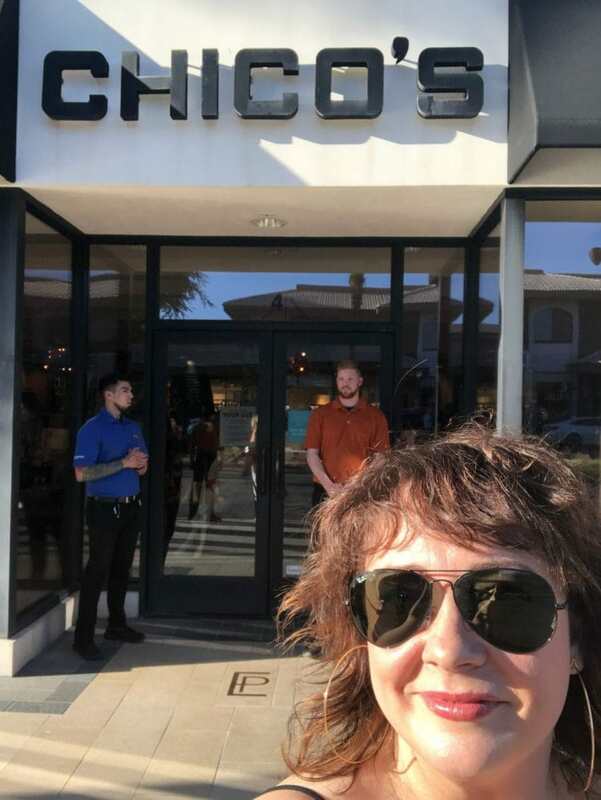 After some time to decompress, we headed to downtown Palm Springs and visited their local Chico’s. It’s the biggest and highest volume Chico’s store and is as big as a small department store! 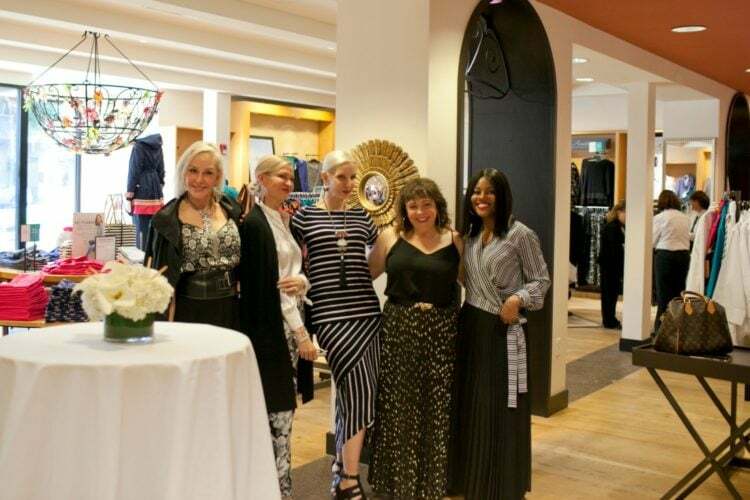 They were having an in-store event with passed hors d’ourves and champagne, demonstrations of their stain-resistant clothing line, and special discounts. Chico’s provided each of us with a gift card. I haven’t shopped Chico’s in person in a while and it’s good to do so as things look different in person. Often things I pass by online appeal to me in person. 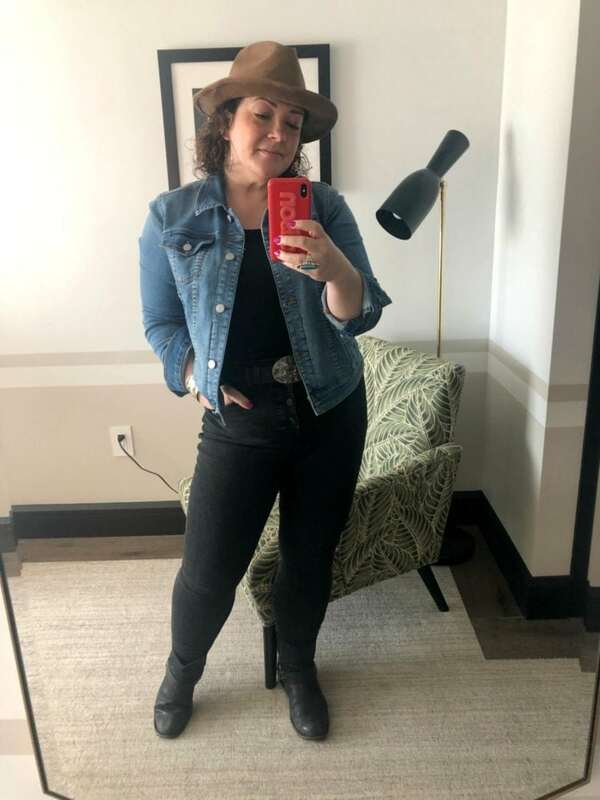 I ended up purchasing this shell in blush pink (size 2), a belt bag (size medium, no longer on the site), this beaded necklace and two of the matching bracelet, and this white denim jacket (size down, I went with a 1). After as a group we went for dinner at The Venue, a sushi restaurant across the street from Chico’s. Super delish. After we headed to Fashion Week El Paseo. The largest fashion week on the West Coast, Fashion Week El Paseo has quite a variety with a theme every evening. That evening it was California designers. On the car ride there, I changed from my flats to a pair of strappy black heels to make the look more cocktail attire. 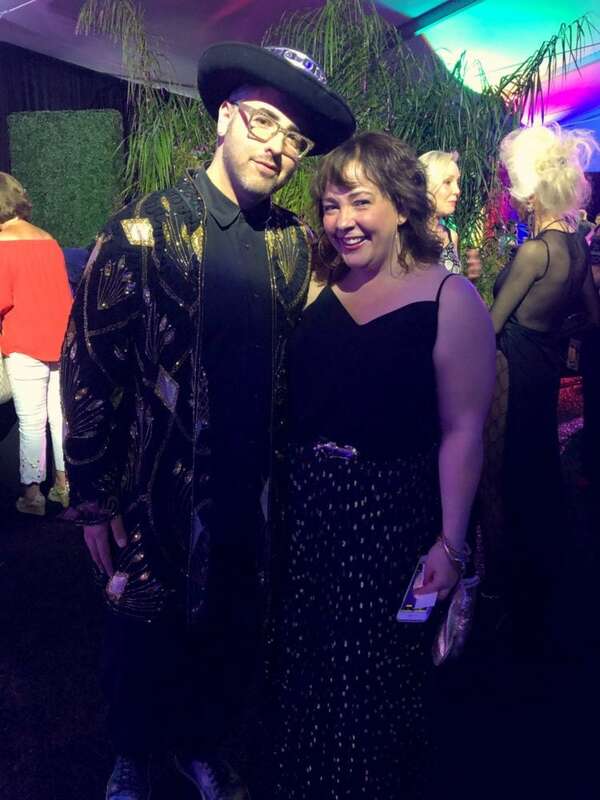 We mingled, got photos on the selfie wall, and even met Ari Seth Cohen, founder of Advanced Style, and some of the fierce fashionistas he has featured (including his mom!). We then got our seats for the shows. We saw three different designers; my favorite was Zandra Rhodes. An icon, Rhodes helped put London on the fashion map in the ‘70s. 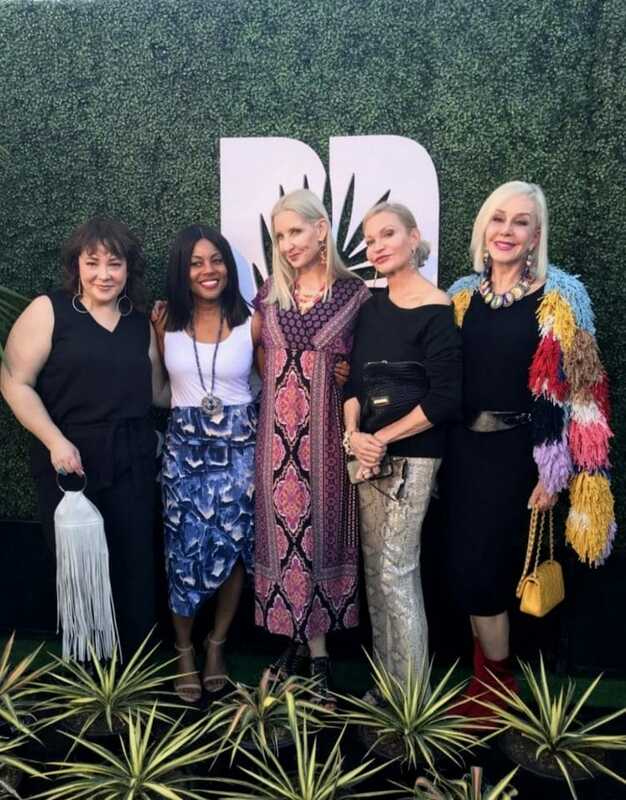 After showing her designs to Diana Vreeland, Rhodes’ fashions were featured in American Vogue and began selling at Henri Bendel, and then other retailers like Saks and Neiman Marcus. She has dressed famous fashionistas and fashionistos such as Princess Diana, Debbie Harry, Freddie Mercury, Bianca Jagger, and Isabella Blow. 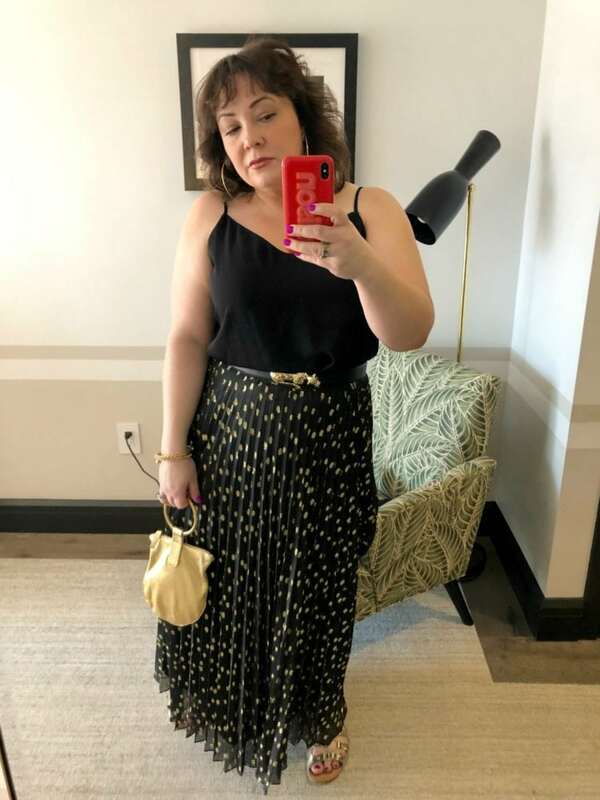 I wanted almost every piece in my wardrobe; I loved the femininity, the mix of patterns, and how everything was so breezy and feminine and fun. Through a group chat on Instagram DM, we influencers agreed to meet for breakfast at the hotel restaurant at 8 am. We didn’t have a ton of time between breakfast and heading out for the day so I dressed for both occasions. 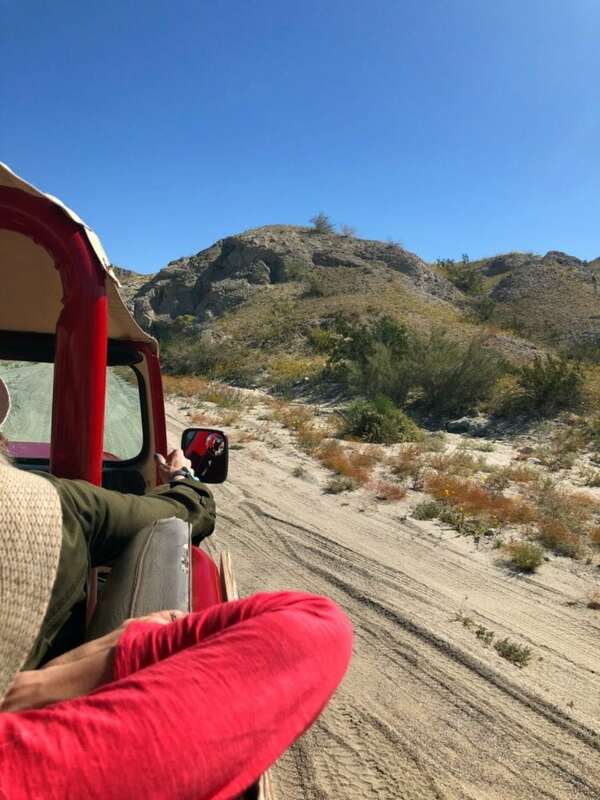 That day we headed out for a Jeep tour of the San Andreas fault area with Desert Adventures. 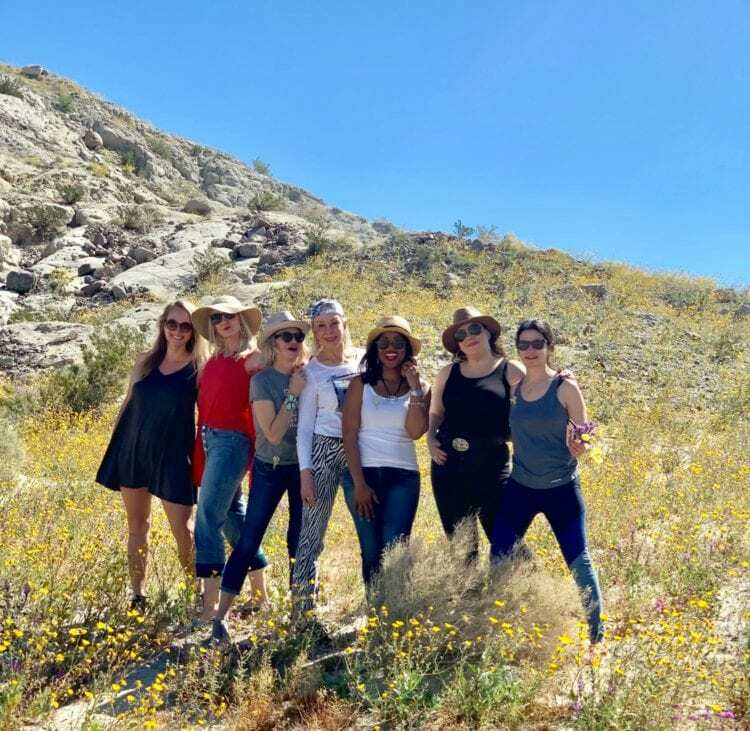 It was a gorgeous day, and the desert was especially gorgeous with wildflowers thanks to the rains the previous month. In fact, our tour guide Rick informed us this was the most vibrant display of wildflowers in 50-100 years because of the February rainstorms. This part of the trip was especially awesome for me. Riding in the back of that Jeep looking at all of Mother Nature’s beauty literally brought me to tears. It was so great to be with a group of women who totally got how I was feeling, it was a really special time. 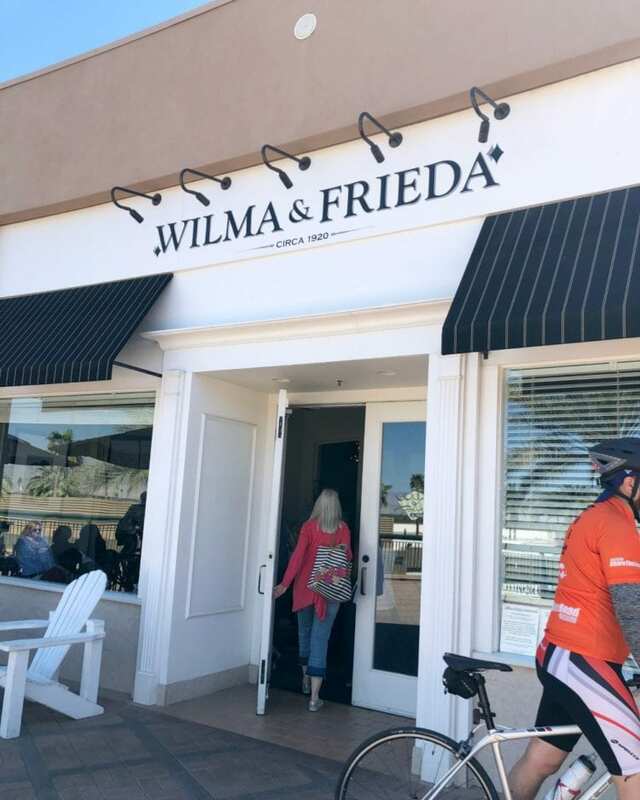 After the Jeep tour, we grabbed lunch at Wilma & Frieda, then had a couple of much-needed hours to wash off the desert dust and take a disco nap before the evening festivities. For the evening we headed back to Fashion Week El Paseo. This night was for the dogs… literally! 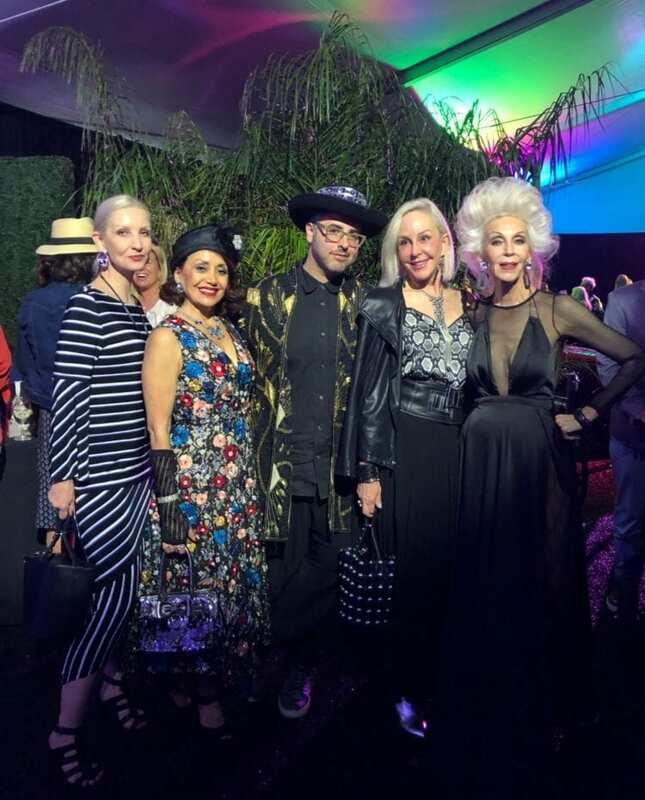 It started with a cocktail reception and silent auction with proceeds benefiting Animal Samaritans, then two fashion shows. The first one featured gentlemen walking the runway with their dogs, the second one had models in designs by Victor Tung strutting the catwalk with their four-legged friends. After the show, we headed to Fresh Agave for a late dinner. And after dinner, we five influencers enjoyed some laughs around the fire pit at the hotel. We influencers returned to the hotel restaurant for a breakfast together before we headed in separate directions back home. After breakfast, I took advantage of a spa gift card Chico’s gave me (it was to be used the first day before everyone else showed up but my flight was delayed). I had a fantastic Royal Massage at the Sands Spa, which is just as beautiful as the rest of the hotel. 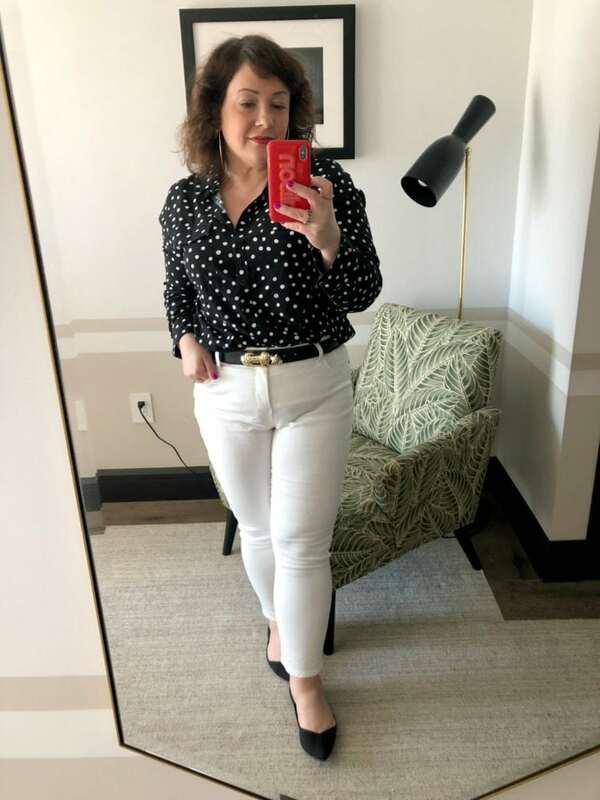 What I Wore: Same exact thing that was worn on the flight to Palm Springs (I brought a second of the same cami and switched that out). At noon, a black car arrived to take me to the Palm Springs airport and back home to the Washington, DC area! I shared in this post about how special the trip was but I just have to rave again. Everything was perfect – the mix of influencers, the hotel, the activities, the weather… it was a weekend I won’t soon forget! Your link to the denim jacket doesn’t work. Do you have another link to Soma clothing rather than pj’s etc. Great blog; very informative and down to earth. Good stuff. I wonder why the links aren’t working for you, I tried them on two browsers and they opened okay. 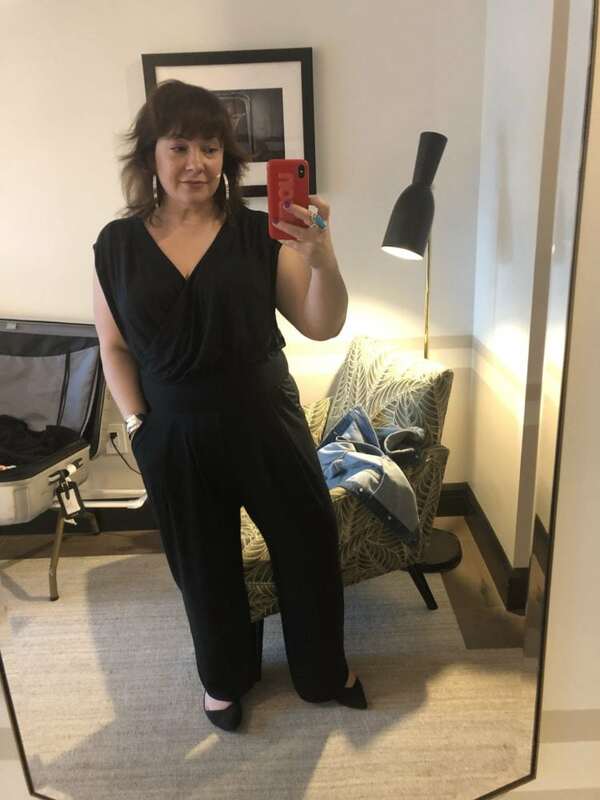 Let’s see if this link works for you: http://bit.ly/2JwmrNj and I reviewed their casual clothing last year in this post: https://www.wardrobeoxygen.com/building-a-work-from-home-wardrobe/ Glad you like the site! One other thing. When you were out in the jeep, did you notice the desert smell? It is fragrant, kinda spicy because of the particular plants that grow there. Nothing else is quite like it. I did, it was amazing!! I didn’t realize it until I did some research but this year is one of the best desert spring wildflower blooms in many, many years. Wow, was your timing perfect! I am so delighted that the southern part of my state showed off for you so nicely. The desert in the Spring is truly wonderful. In the Summer, not so much. It is hideously hot. I’m talking Dead Donkey Hot. The heat will make you want to stay in your air-conditioned room all day or float in the pool IF the pool has areas in the shade. If you can visit the area again, I hope you will have time to go ‘up’ as well. You might have noticed that are some serious mountains nearby. It’s well worth renting a car to drive up in the mountains, take an aerial tram ride, hike some of the trails, or a combination of all 3. It’s a rather odd but pleasant feeling to be thousands feet about the hot desert valley floor but surrounded by conifers and perhaps some snow. I see from your photos that there is still a little snow up high. I love the place where you stayed and your pictures of it. I think the decor and the colors fit in with the desert so well. I made the mistake of looking at the food and drink menus for the Pink Cabana. Oh my Lord! I had the compulsion to go the airport ASAP and head for Palm Springs. Again, I am so very pleased that you took advantage of the Chico’s invitation. And with your wonderful writing and photos, I felt like I was right there with you. The wildflowers were AMAZING! And I totally want to return and go up into the mountains. Everything was so beautiful and it was the perfect time of year to visit too! 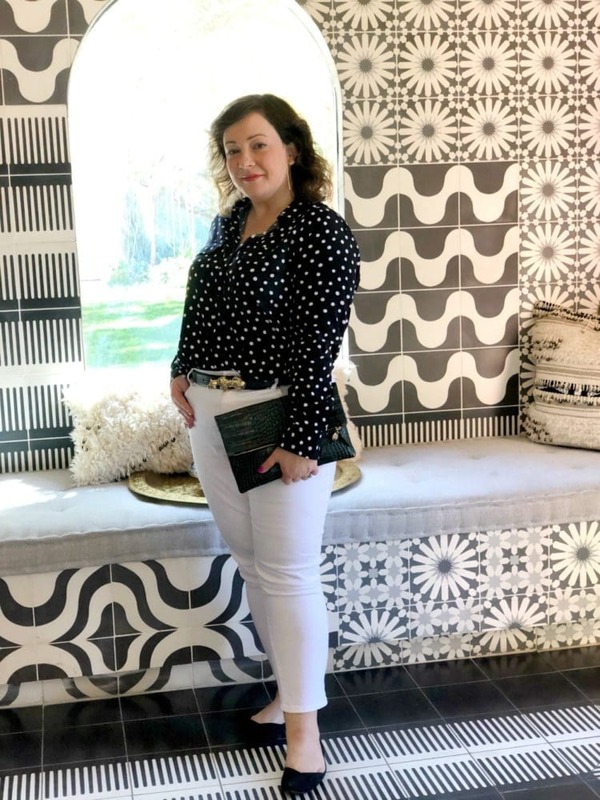 Love your travel outfit…the black and white tiled shower in the bathroom…Ari Cohen and his wonderful “models”, blooming desert tour, the shiny silver wall in the spa…plus Chico’s fashions….This was a total Palm Springs WOW! Thanks for sharing all the fabulous pictures of this amazing trip. I’m glad you liked it! It was such a cool experience! What a fantastic trip you all had! Both the hotel and the landscape look so beautiful – it’s now on top of my wishlist of places to visit. I love how varied your outfits are, some relaxed, some chic, some glamorous, it must have taken lots of planning ahead! Your turquoise jewellery is really amazing! Stay tuned I’ll be featuring the turquoise jewelry on the blog in the near future! I totally want to return to Palm Springs, it was gorgeous! They do have a panel that covers the top half of the belly. I don’t love it, but it seems less visible and like it’s doing anything after a washing. This sounds like such a fun trip! I love seeing you with the other bloggers & how beautiful and unique you all look. 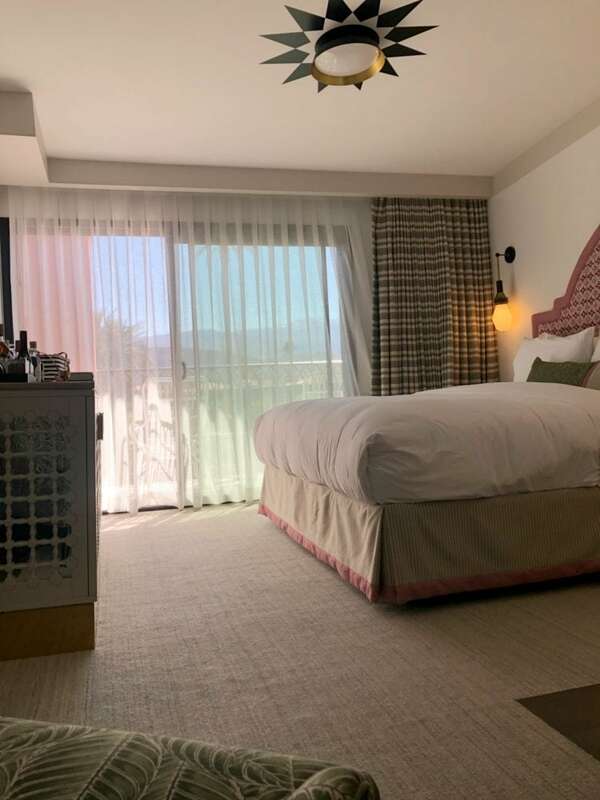 Palm Springs and that hotel—just gorgeous! I’m glad you liked it, Lee! It was such a special time! An amazing weekend with amazing ladies! I feel like I’ve known you for years too, Alison! Meeting you in person was just the icing on the cake … you’re as warm, funny, and real as I knew you would be! I’m still on an emotional high from this weekend of bonding, laughter, and inspiration!